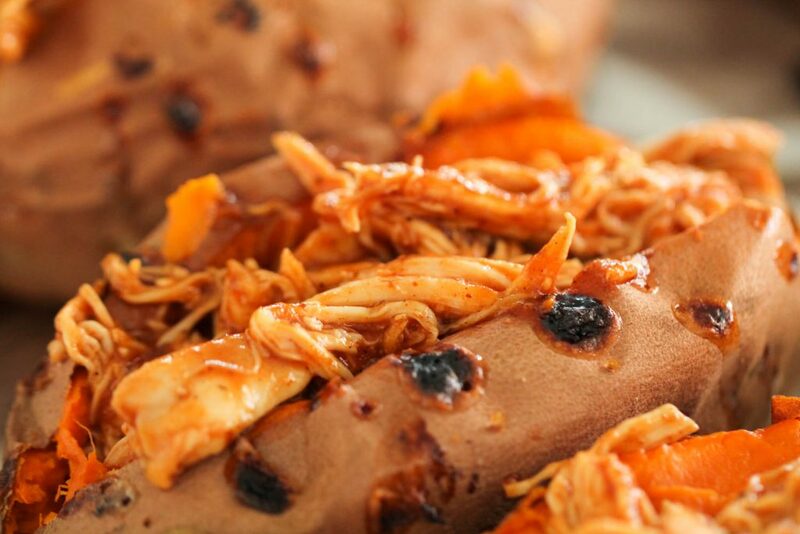 BBQ Chicken Stuffed Baked Sweet Potatoes are a healthy recipe filled with flavor. A soft, sweet potato baked in the oven and topped with barbecue chicken, red onion, mozzarella cheese and cilantro. There are a few different ways to bake sweet potatoes, depending on how much time you have. I’ve tried a variety of ways, and the two options below are my favorite. 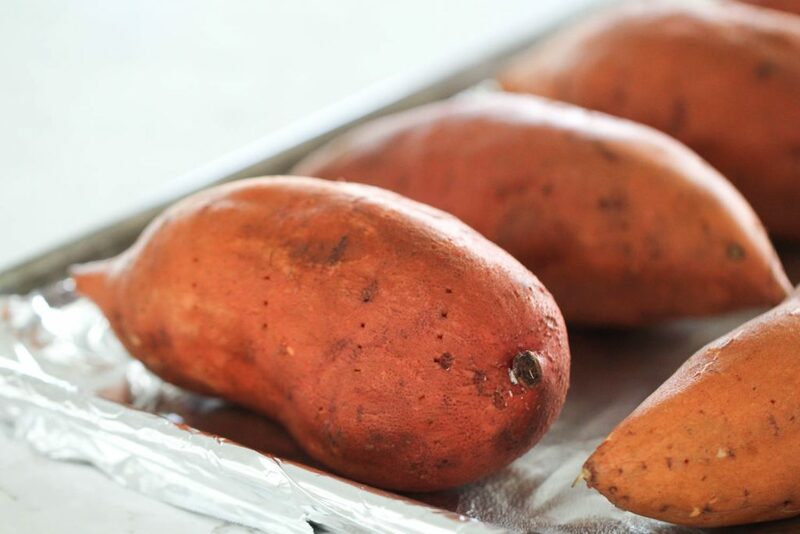 Wash your sweet potatoes and remove any blemishes, poke the outside multiple times with a fork and wrap in foil. Bake at 350 degrees F for 1-1 1/2 hours, or until a fork easily presses into the center. If you don’t have as much time, you can poke the outside of each washed sweet potato multiple times then place them on a baking sheet and place on the middle oven rack. Turn oven on to 425 degrees F. and bake for 45 minutes, or until a fork easily presses into the center. Poking holes in the outside of your sweet potatoes before baking will help them to not split and crack or squeak while cooking. The holes will leak from the inside which gets a little sticky, so I like to cover my fan in foil for easy cleanup. Sweet potatoes contain high amounts of fiber and potassium. They have a few more grams of natural sugars than regular potatoes, but contain more nutrients with fewer calories. 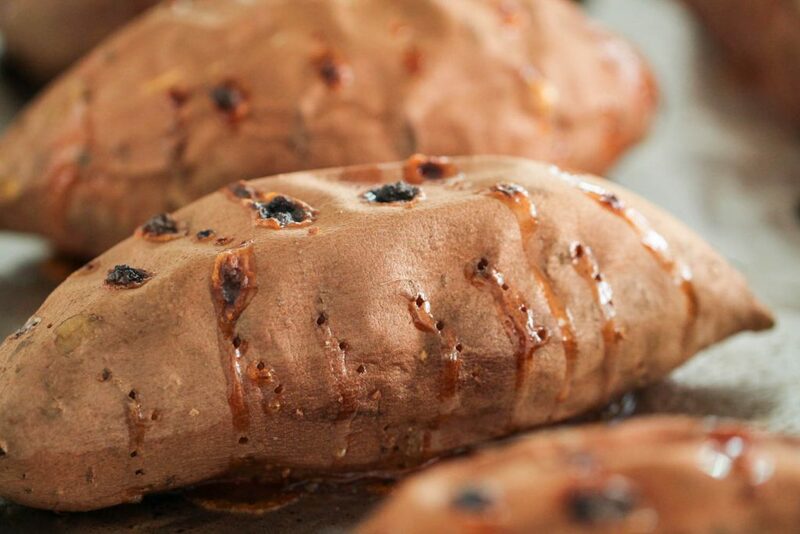 Sweet potatoes are also full of calcium, Vitamin C and Vitamin D.
The first step of making BBQ Chicken Stuffed Baked Sweet Potatoes is by making the BBQ chicken. I sprayed a 9×13-inch baking pan with nonstick cooking spray and placed 3 chicken breasts inside. 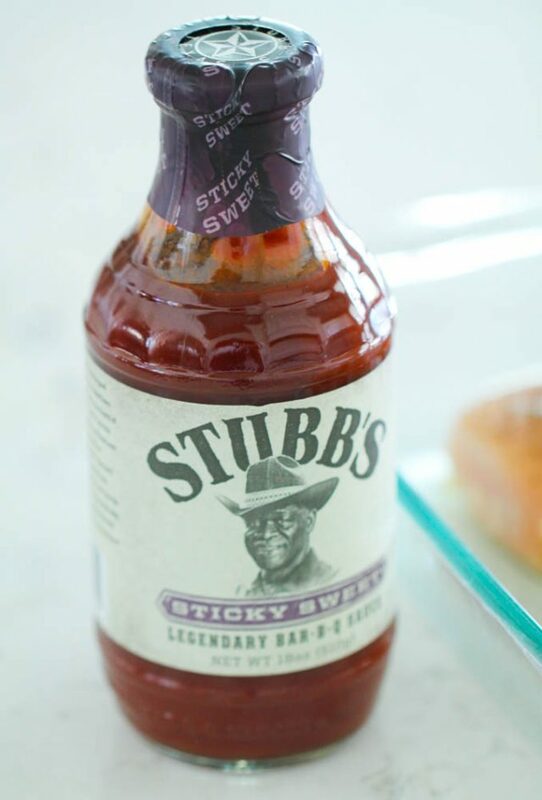 Next, I poured on my favorite BBQ sauce, which is Stubb’s Sticky Sweet Sauce. I love that this sauce just has a few simple ingredients and has such great flavor. You could use any BBQ sauce your family prefers. I baked my chicken at 375 degrees F. for 25-30 minutes, or until cooked through. After the chicken was done cooking, I shredded it but you could also dice it if you prefer. 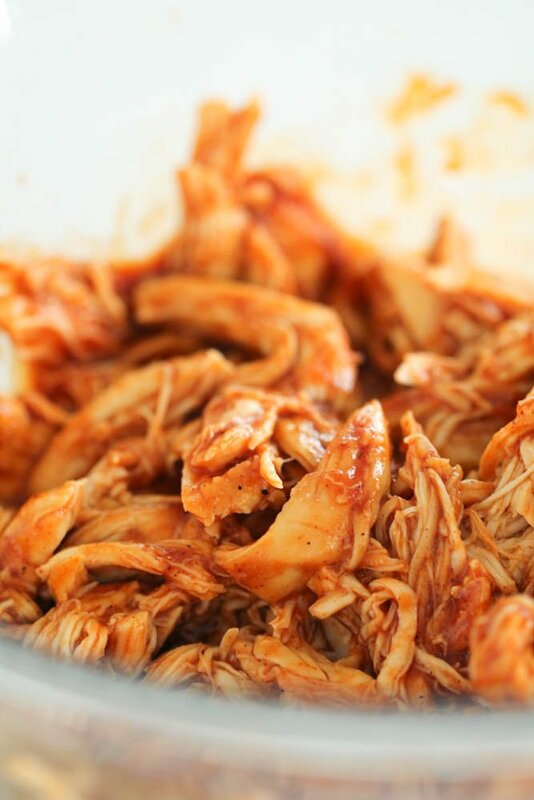 If you are short on time, you could easily use shredded rotisserie chicken and toss it in BBQ sauce and you are good to go. Follow the instructions above on how to bake sweet potatoes. After they are baked, remove from the oven and cut down the center. Fill the center of each baked sweet potato with BBQ chicken. Top the stuffed potato with shredded mozzarella cheese, diced red onion and cilantro. Return pan to the oven and broil on high for 2-3 minutes, or until cheese is melted. Don’t those look amazing? Not only were they so delicious, but they are pretty healthy too. Each potato has roughly 350 calories and 18 grams of protein so you stay full and satisfied. These stuffed sweet potatoes have all the flavor of BBQ Chicken Pizza and even my picky eaters loved them. They also work great as leftovers. I simply scooped out the inside of my leftover refrigerated potato onto a plate and microwaved it for a minute or so. 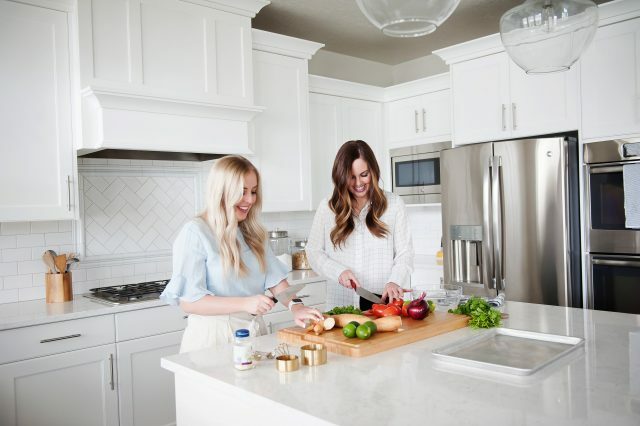 Take the stress out of dinnertime with one of our menu plan programs! Each week we will send you a weekly menu plan and shopping list to help make your life easier. Learn more, view sample plans and join HERE! 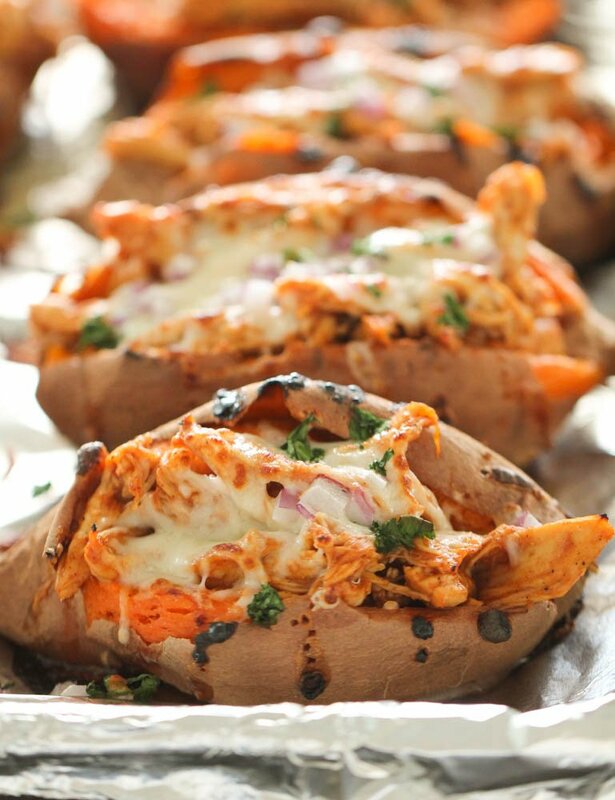 Healthy and delicious BBQ Chicken Stuffed Baked Sweet Potatoes. Everyone loves these soft baked potatoes filled with BBQ chicken, mozzarella cheese, red onion and cilantro. Scrub the outside of each potato and remove any blemishes. Poke the outside of each sweet potato multiple times with a fork then place on a baking sheet and place on the middle oven rack. Heat oven to 425 degrees F. and bake for 45 minutes, or until a fork easily presses into the center. Meanwhile, spray a 9x13-inch baking dish with nonstick cooking spray. 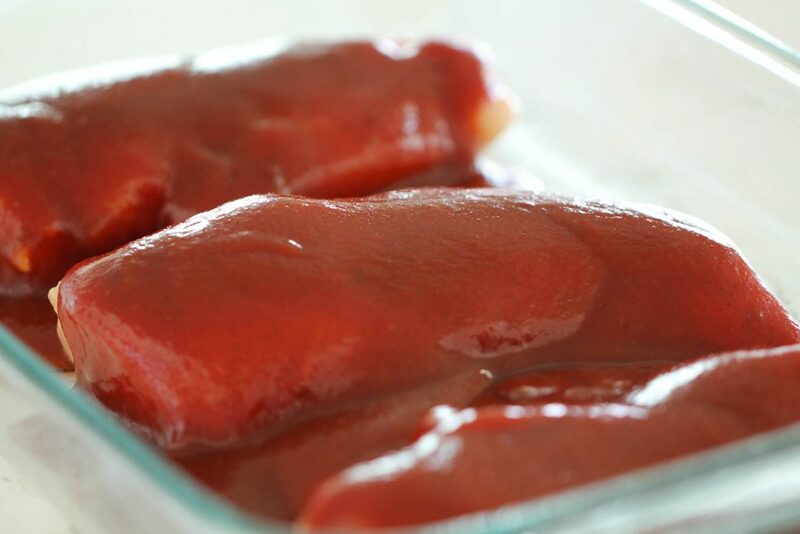 Place chicken breasts in prepared pan and cover with BBQ sauce. Bake at 375 degrees for 25-30 minutes, or place in the oven with the sweet potatoes for the last 20 minutes of cooking. Make sure chicken is cooked all the way through. Remove chicken and sweet potatoes from the oven. Cut each sweet potato down the middle and fill with shredded chicken. 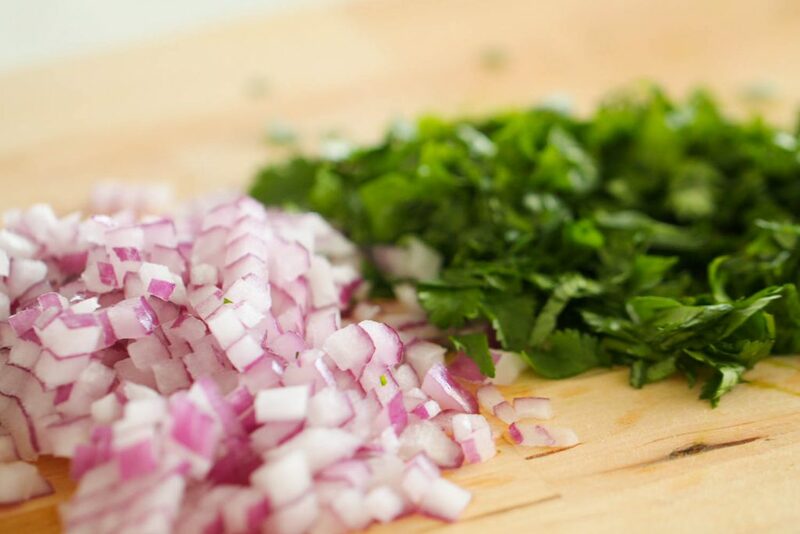 Divide mozzarella cheese, red onion and chopped cilantro evenly between each potato and put on top of each baked potato. Broil on high for 2-3 minutes, or until cheese is completely melted.